The lead FBI official at the heart of the rapidly unraveling Trump-Russia probe sent a text message to his FBI mistress last year which discusses some sort of 'insurance policy' against Donald Trump becoming president. Clearly Lisa Page thought there was no way Trump would win during a conversation in then-Deputy FBI Director Andrew McCabe's office, yet Strzok clearly states to Page that he "can't take that risk" in the "unlikely event" Trump was elected, and that an insurance policy of some type existed to presumably undermine Trump. If this is the case, it would constitute an active measure taken by the FBI against one candidate for US President, while aiding the other. The text message which references an "insurance policy" is all the more controversial when you consider another exchange in which Peter Strzok says "I am riled up. 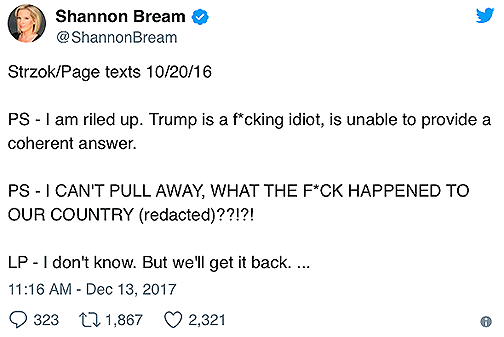 Trump is a f*cking idiot, is unable to provide a coherrent answer," and "I CAN'T PULL AWAY, WHAY THE F*CK HAPPENED TO OUR COUNTRY (redacted)??!?!" Page responds "I don't know, But we'll get it back. ..."
Page then messages Strzok, saying "And maybe you're meant to stay where you are because you're meant to protect the country from that menace. (links to NYT article), to which Strzok replied "I can protect our country at many levels." 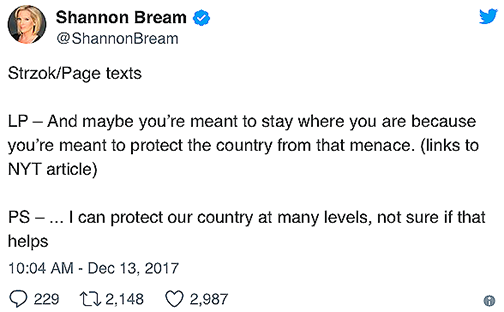 What, exactly, does Peter Strzok mean by "protect our country at many levels" in his text to Page? Is this a reference to the insurance policy? 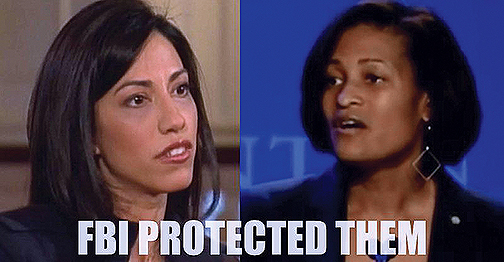 The "insurance" text message was one of 375 released Tuesday night before a House Judiciary Committee hearing with Deputy AG Rod Rosenstein, and one of 10,000 text messages exchanged between the two top FBI investigators. 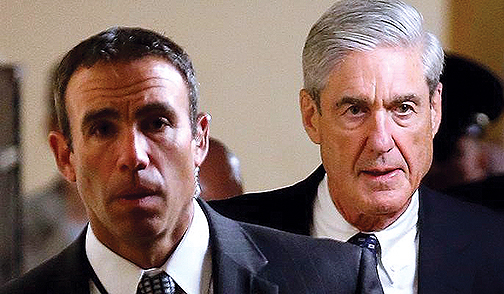 Strzok was fired from Robert Mueller's special counsel in August, however the reason for his dismissal was not revealed until last month, prompting several congressional panels to turn up the heat on the FBI and the DOJ. The text messages make abundantly clear that Strzok - the man who downgraded the FBI's assessment of Hillary's email mishandling from "grossly negligent" to "extremely careless," and reportedly used a largely unfounded Trump-Russia dossier to launch a counterintelligence operation - holds a deep disdain for Donald Trump. As we reported earlier, in one exchange obtained by Fox News sent on March 4th, 2016 - right around the time Trump emerged as a serious threat in the GOP primary race, Page texted Strzok "God, Trump is a loathsome human," to which Strzok responded "Yet he many[win]" Strzok responded, adding "Good for Hillary." Other text messages call trump an idiot, who's awful. 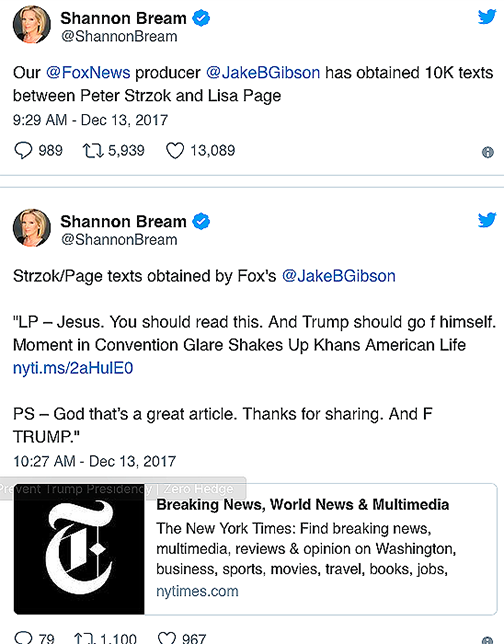 Fox reporter Shannon Brem tweeted that Fox News producer Jake Gibson has obtained 10k texts between Peter Strzok and Lisa Page, one of which says "Trump should go f himself," and "F TRUMP." "Responding to the revelations about Strzok’s texts on Saturday, Nunes said he has now directed his staff to draft contempt-of-Congress citations against Rosenstein and the new FBI director, Christopher Wray." - Fox News. As we also reported, Representative Jim Jordan (R-OH) suggested in a hearing with FBI Director Chris Wray last week that the Peter Strzok rabbit hole might be far deeper than anyone imagined. 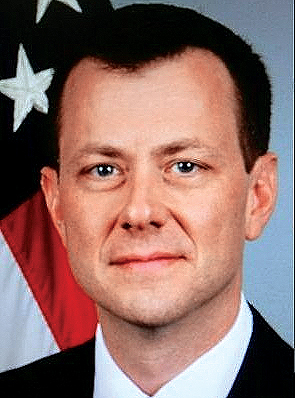 To summarize, Jordan's theory is that Strzok received the controversial "Trump Dossier" from the Clinton campaign then went to the FISA courts where he passed it off as a legitimate piece of intelligence in an effort to obtain the warrants necessary to effectively spy on the Trump campaign. Deputy Attorney General Rod Rosenstein - who launched the Mueller probe - was on the hot seat today in front of the House Judiciary Committee to face questions over Strzok, Mueller, and the Trump investigation. When asked if he was aware how biased Peter Strzok was, Rosenstein answered: no, adding that he has seen "no reason to fire Mueller."